Enhance your bath with the stylish and elegant Star Wall / Spa Bath Set. Featuring a unique design, which is both attractive and easy to use, the Star Wall / Spa Bath Set will be a winner in any bathroom installation. Furthermore, it is specifically designed for straightforward installation in standard Australian bathrooms. 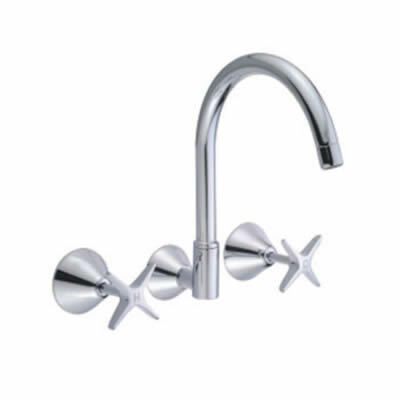 The tap features a curved spout, while the lever handles are star shaped. The body is made entire out of solid brass construction with a modern chrome finish. Rest assure this bathroom tapware is a heavy duty and reliable unit. The Star Wall / Spa Bath Set boast water efficiency. As such, it features a 4-star WELS rating and has a water flow rate of 7.5 litres per minute, which is more than enough for use in a standard bath. 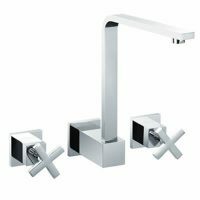 This bath tap set is a rugged and sturdy product which is built to last the rigors of daily bathroom usage. 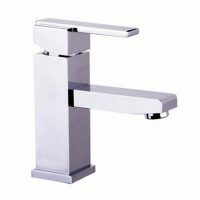 The tap internals, body as well as the chrome finish are backed by some great manufacturer offered guarantees. So, give your bath a facelift with the gorgeous Star Wall / Spa Bath Set. Buy from us today at Ross’s Discount Home Centre for the best bargain on this product!